At some point we will all think about selling our last sailboat; we’ll never want to give up our love of the oceans, or the Bay and the Intercoastal. As we slow down from our ocean voyaging days, we can’t bear to give up cruising. We want to enjoy the sailing life in a different way. The good news is there are some beautiful vessels to yearn for. Now you’ll have something to look forward to when the time comes. We have always advised our clients based on what we know, what we do, and what we love. While we have years of sailing still to do, we’ve begun to transition our loyal clients out of sailing and into gorgeous power! It’s a nice thing to look forward to. We’re eager to assist you in the transition. So went it’s time, let us sell your ocean going sailboat and find your power! This vessel is an absolutely gorgeous power cruiser designed by Chuck Paine, one of our favorite designers. We’ve seen Wolf in the IntraCoastal cruising at 18 knots, and of course, slowing for us sailors. We’ve seen her in the Bahamas were she was slipped next to us in Nassau; she crossed the Gulf Stream two days after us! Chuck Paine adapted the traditional Down East style, lobster hull to be a fast, updated, fiberglass version of those revered workboats. Several of Paine’s “Wolf” were built; Bernie just inspected two of them with clients he assisted in their sail to power transition. They are what you would expect from Chuck Paine, the artist and sailor! These particular clients, who have owned two Valiants, ended up falling in love with a more mainstream Grand Banks Eastbay 43. Grand Banks is well recognized for its high quality build and satisfied customer base. The Eastbay series has filled a niche in the market producing quality Downeast style cruisers that can comfortably make 20 knots and even more depending on conditions. Throttle back and cruise in an affordable realm. After a lifetime of experiencing 8 knots as super fast, it can be fun to get there at 20 knots, well in time to shower before cocktails! Let us help you through the entire process of selling your “last” sailboat and finding your power! Before discovering sailing, Bernie grew up on Long Island, the Great South Bay and Montauk, the sport fishing capital of the universe. He’s loved the amazing designs of Ray Hunt, Buddy Davis, and the other great designers of these proven lobster hulls. Coming from sail you appreciate the characteristics of a displacement hull with a lot of boat in the water. There are some wonderful trawlers that do sailboat top speeds reliably and affordable trawling at 7-9 knots. If you want 20 or 30 knots, you need to think about a fast cruiser with a semi-displacement hull, still with a deep V hull shape, essentially a fishing boat hull shape, a lobster hull, that can smooth out the waves and take you places. With the type of weather forecasting we now have, and the speed of 20 knots, the windows of opportunity to “sail” to a destination are a lot wider. You can sure enjoy a lot of cruising under power. Let us help you figure out what type of cruising is next and what type of cruiser you need. Depending on the type of cruising you’ll be doing you’ll have many choices among the beautiful, seakindly lobster hulls like the Wilber, Stanley, Holland, Wesmac to name a few, or if it’s a semi displacement hull of the Eastbay, Sabre, Back Cove and others. These amazing fast cruisers, like our favorite, Wolf, have a V-shaped, semi displacement hull with a comfortable, dry, and fast ride. You’ll love the build quality and the fit and finish with hand rubbed teak joinery and all the amenities. You will not be the first of our sailing friends to make a bold switcharoo to a beautiful power yacht that does exactly what they want to do. Some of us just want to keep living aboard on the water enjoying the incredible lifestyle of live aboard full time cruising. Living aboard full time can make you really appreciate a trawler! At least this is what our friends tell us. We’ve heard it all. You no longer enjoy the long oceans passages. You end up motoring everywhere. You hate your refrigerator. Maybe you just really love the live aboard cruising lifestyle. Is it time to desire a really nice bedroom with a big bed you can each climb in on your own side? Do you seem to want a real kitchen with great appliances? How would you enjoy a patio and a living room? And even a real captain’s bridge with great visibility and all the comforts of inside steering and modern electronics? That doesn’t sound all that bad, does it. Case in point, our dear friends lived aboard their Tayana 37 for 29 years and they just woke up one day and realized that living aboard a sailboat is a lot harder than living aboard a beautiful trawler! So we sold the Tayana and assisted in the acquisition of a very suitable and affordable home! They still dream of going back to the Bahamas and they have the boat to do it easily, all on a sailor’s budget! 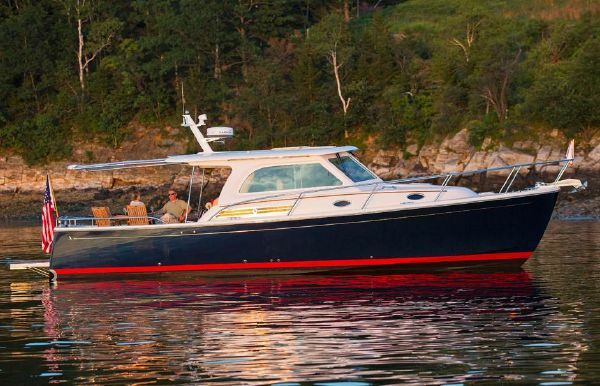 So, if you have a big appetite for power cruising, you’ve be lusting after a Nordhavn for years! Fes up! We all do. If money is no object, you just might circumnavigate under power! However, there is much to consider regarding operating costs of fuel and maintenance. Let us help you with a realistic transition to a “right” boat for your purpose and pocket! If it’ a Nordhavn, that would be awesome. In 2008 there were 29 Nordhavn “sailors” that showed up at the first rendezvous in Bristol RI. The Nordhavn is pretty much the Hallberg Rassy of power; they have rendezvous all over the world! Check out this website www.nordhavn.com/egret/index.php4. Voyage of Egret reminds us of the early days of cruising sail with the Hiscocks and the Rothschild’s, even Slocum in his time. Nordhavn is renowned for good reason. If you are just a little more independent, there are some amazing custom ocean trawlers. Our good friend owned a beautiful red Valiant 50. We called her big red. But then with dreams of sailing one of the last great wild places, Alaska, we sold his Valiant so he could buy a real Big Red! So if it is a Nordhavn, or a custom steel trawler like Big Red or a more modest trawler, our sailing friends are out there blazing the trail for the rest of us to follow in their wake. Bernie & Kate, Your Transition Team! Here we are located at the RogueWave office of David Walters Yachts in Annapolis, which is the best place in the universe to sell your sailboat. And we are right here on the Chesapeake Bay, in the middle of the most desirable cruising grounds on the East Coast. Let us help you transition from your beloved sailboat into a boat that you can totally enjoy for years to come.